JAKARTA, Indonesia – Indonesia again spoke on the issue of palm oil during the 22nd ASEAN-EU Ministerial Meeting in Brussels, on Monday, Jan. 21, and reiterated its rejection of discriminatory policies against palm oil products. Deputy Foreign Minister A.M. Fachir, who led the Indonesian delegation, presented the facts regarding the contribution of palm oil to the achievement of the Sustainable Development Goals (SDGs). 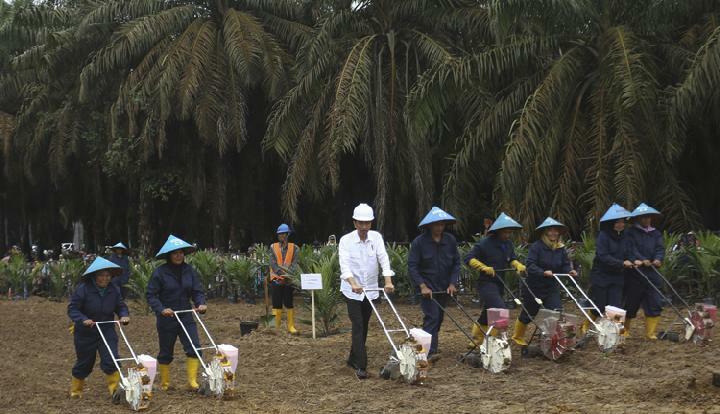 “Palm oil is a strategic commodity for Indonesia, especially for small farmers. About 20 million people in Southeast Asia depend on their lives for palm oil industry and more than 5 million small farmers in Indonesia, Thailand, as well as the Philippines rely on oil palm,” Fachir said in a statement from the Foreign Ministry in Jakarta on Tuesday. In the global context, palm oil has contributed to the achievement of 12 out of 17 goals on the SDGs, including poverty alleviation, eliminating hunger, as well as improving clean and affordable energy. “Refusing palm oil is the same as rejecting the SDGs, which is a global agreement,” Fachir continued. In addition to the issue of palm oil, Indonesia also invited ASEAN and the EU to increase contributions in fighting for Palestinian independence. The two-state solution and humanitarian assistance for the Palestinian people are the two most crucial issues in which ASEAN and the EU must continue to work together. “The political differences of the international community must not discourage commitment to the humanitarian issues faced by the Palestinian people,” Fachir noted. The ASEAN-EU partnership is very important in addressing the current global situation. The rise of “inward-looking” policies based on short-term domestic interests requires ASEAN-EU to strengthen cooperation in the interests of the people of both blocs and the world. “In the midst of the current world uncertainty, ASEAN and the EU, as two regional powers, must collaborate to fill the vacuum of global collective leadership,” Fachir noted. Furthermore, the Deputy Foreign Minister stressed the importance of the ASEAN-EU Partnership, which must be based on mutual trust and mutual respect. This attitude of mutual trust and respect can be translated into policies that advance the common interests of ASEAN and the EU, including stopping discriminatory policies on oil palm which are in the interests of the ASEAN community, especially Indonesia. During the meeting, Fachir invited ASEAN and the EU to strengthen partnerships in contributing to solving various global challenges. In the issue of peace, as two regions that have succeeded in maintaining peace and stability, ASEAN and the EU are expected to inspire other regions to continue to promote a culture of peaceful dialogue and resolution of conflicts. In addition, ASEAN and the EU also need to strengthen cooperation in facing cross-national challenges such as terrorism, radicalism, and irregular migration. In the economic field, Indonesia invites ASEAN and the EU to strengthen economic cooperation and fight protectionist tendencies. The ministerial meeting was attended by foreign ministers or those representing 10 ASEAN member countries, 28 EU member states, and ASEAN Secretary General. It was chaired jointly by Singapore Foreign Minister Vivian Balakrishnan and EU Commissioner for Foreign Affairs and Security Policy Federica Mogherini. The meeting discussed various regional and global issues and conducted an evaluation of the partnership between ASEAN and the European Union, which has been established for 42 years.